Best Dental offers porcelain dental bridges to close gaps in your smile line caused by missing teeth. If you are missing one tooth or multiple teeth, Dr. Jasmine may recommend a fix dental bridge which is non-removable. If you’re looking for a Dental Bridge in Houston, you have come to the right place! A bridge is anchored and cemented into place using the adjacent teeth, and it is custom made using our high-tech lab to fit your mouth perfectly! Below are common questions that we get about dental bridges, so feel free to educate yourself. If you have any further questions, don’t hesitate to contact us today to schedule your appointment. What Is The Difference Between a Dental Bridge and a Dental Crown? Similar to dental crowns, dental bridges require the reduction of teeth to help hold a fake tooth also known as a pontic in place. The pontic is placed next to the sides of the gap and is fused with the other units and permanently cemented in place. The teeth holding the fake pontic in place area known as “abutment teeth.” In comparison, a dental crown is just one unit that is cemented in place. Traditional bridges are the most famous kind of dental bridge. These bridges consist of one or more pontics (or fake teeth) and are held in place by adjacent dental crowns. 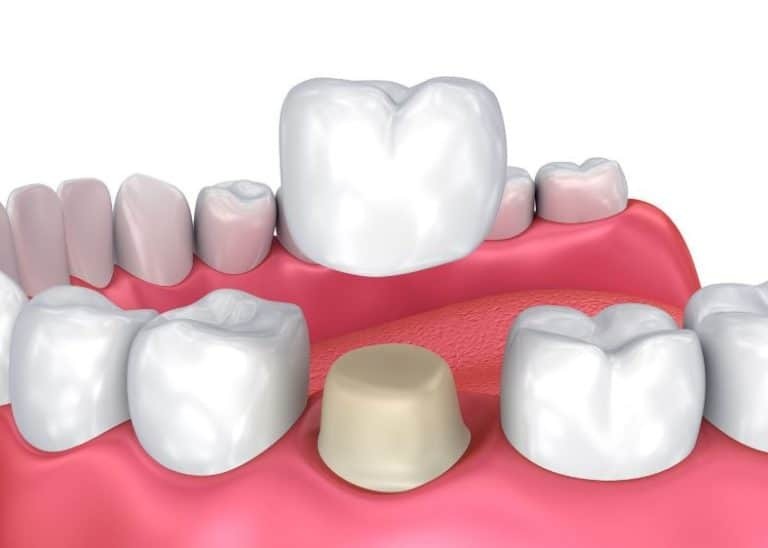 These dental crowns are also called abutments, and they are cemented onto the teeth adjacent to your missing tooth with a specialized kind of dental cement. Traditional bridges can be used when you have healthy natural teeth on both sides of the missing tooth. Bridges are even strong enough to replace posterior molars. The downside of traditional bridges is that Dr. Jasmine will have to prepare and reduce the adjacent teeth to be able to have room to cement the dental bridge into place. Maryland bridges are an alternative choice to traditional dental bridges. These bridges consist of a pontic that is held in place by a framework that is bonded onto the backs of the two teeth adjacent to the missing tooth. Since this type of bridge is not held in place by crowns, the adjacent teeth don’t need to be reduced or filed down. While Maryland bridges are a more conservative option than traditional bridges, they do have their downsides. The strength of the bridge is limited by the cement that holds them in place. It may not stay in place in areas of the mouth where the teeth are subjected to a lot of biting force, like the molar region. 3) Dental Implant Supported Bridges? Implant supported Dental Bridges are another option for replacing missing areas. 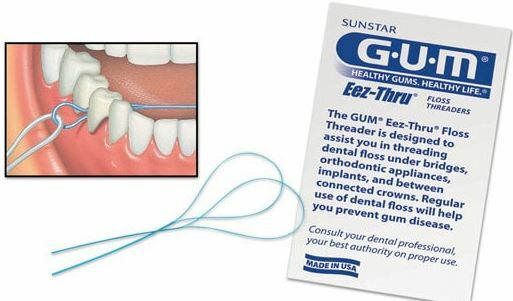 They can be used when you have more than one tooth missing. 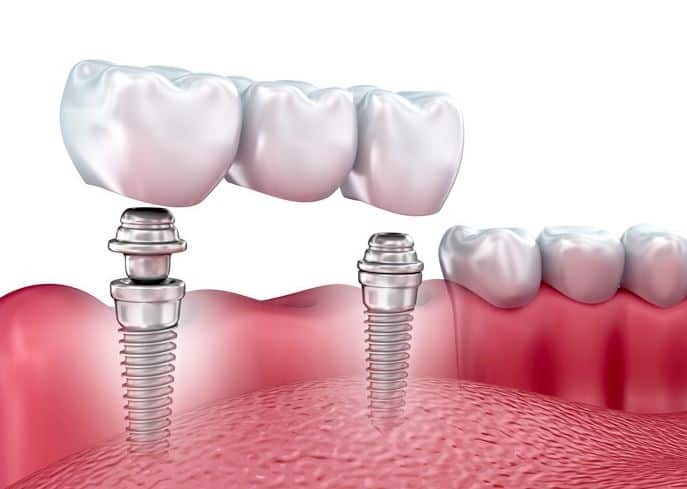 Instead of being supported by dental crowns, these bridges are supported by dental implants. Usually, one implant is placed for every tooth that is missing, and this series of implants holds the bridge in place. However, the bridge may consist of a pontic (fake tooth) suspended between two implant-supported crowns. Dental bridges usually take only two-short appointments to complete and cement into place permanently. Dental bridges are also designed to last for many years to restore the function, and cosmetics, and health of your smile. Dental bridges can also be recommended to improve the shape of your facial features, replace unwanted removable partial dentures, and preventing the shifting of your teeth due to the existing spaces inside of your mouth. Dental Implant supported bridges may be an excellent option for people who have long areas of missing teeth. How Do I Clean Under My Dental Bridge? At Best Dental, Dr. Jasmine and her team will show you how a water pik or floss threader can be used to clean under your Dental Bridge. A piece of floss is tied to this floss threader and is used to clean underneath the bridge. Regular dental cleanings will be important to maintain the health of your bridge after it is permanently cemented into place. Are Dental Bridges Fixed Or Removable? Dental bridges are fixed and they are not removable. They are placed permanently using dental cement. This cement is either light cured into place, or it sets and solidifies by itself within five minutes. Dental bridges can be expensive if you do not dental insurance. Since dental insurance can cover a portion of the payment, it becomes a lot more affordable. Luckily, at Best Dental we have an in-office Savings Plan for those without insurance to help you save a lot of your hard-earned money! Are Dental Bridges Covered By Insurance? Depending on your plan, a dental bridge may be covered for up to a certain percentage. This can really help save you money during the course of your treatment! This is a very contentious and subjective question that we at Best Dental get asked regularly. In general, with all things being equal, we feel that if we can spare filing down your tooth structure, then that option would be better. There are some cases however, that a dental implant is not advised, and where a dental bridge would be better suited. Dr. Jasmine will explain your best option with you at your consultation appointment. Leading Cosmetic Dentist, Dr. Jasmine will help determine whether a fixed dental bridge is right for you. Come see why she is different that other Houston Dentists. Get the dental care that you deserve today! For more information, please call or visit our office to schedule a consultation today.